Provides enchanted talismans that can be substituted for the enchanted rings found in Enderal, and you can wear more than one at a time. Do you ever ask yourself why you can only wear one ring when you have eight fingers and two thumbs (and toes too) ? 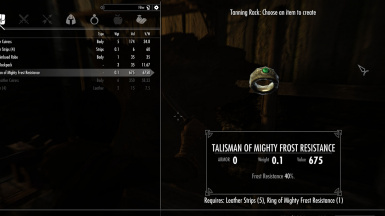 Well, with this mod you can wear talisman equivalents to the enchanted rings in Enderal, and wear several at once. Whether you want to use these to cheat or not is up to you. 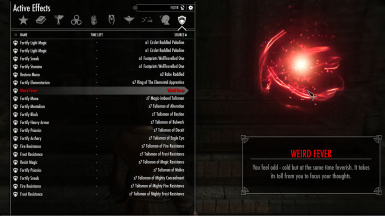 NOTE: this mod is for the 'Enderal' total conversion mod for Skyrim; it will not work with just Skyrim. * The talismans do not use up any body slots, so they cannot interfere with the use of other jewelry or apparel. * The talismans do not show up in your inventory while bartering, so you cannot accidently sell one. 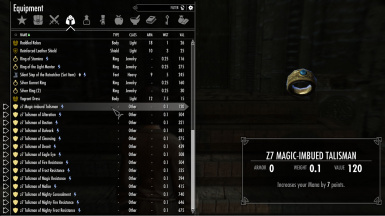 * With the optional file for 'z7 ' prefixed talismans, they sort to the bottom of your equipment list. No need to scroll around them to find other items. * The talismans are named after the rings with the same enchantment, except 'Ring' has been changed to 'Talisman'. * The talismans are not visible in either third-person or first-person views. Wait until you can loot or buy one of the enchanted rings that the talismans can replace. Then take the ring to either an anvil (forge) or a tanning rack and craft the talisman from the ring. You will also need one spare part at the anvil, or one leather strip at the tanning rack. The ring will be replaced by the talisman. Use the excellent AddItemMenu (AIM) mod to browse and select the one(s) you want. It works with Enderal. The AIM mod requires the UIExtensions mod. then type 'player.additem xxxxxxxx 1' without the quotes, changing the xxxxxxxx to the item code of the talisman you want. 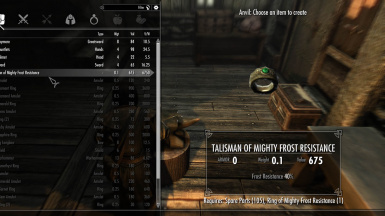 If you know how to edit files, move files and use the BAT and ADDITEM console commands, you can use the files in the miscellaneous download to add the talismans either directly to your player inventory or to a suitable container such as a chest. See the ReadMe tab for item codes and names. The SureAI team may at some point add a new ring or change the name of an existing ring. If that happens, just let me know and I will update. There could be a talent/perk for selling any item to any vendor that may allow selling of a talisman. * I have a different version of SkyUI installed and the category icons look different from those that came with the version the SureAI team used. Do not ask me how to change the SkyUI version or the the SWF icons file(s). You should not be trying to make the change if you have to ask how. * I have the mod for Enderal installed which returns the UI fonts to the Skyrim default fonts. The SureAI team's Dumbledore font looks great but it is hard for me to read with my aging eyes. * I have the Jaxonz Renamer mod installed. That is how some items are named with an 'a1 ' prefix to sort to the top of the list. * SureAI team for an excellent total conversion mod. * 'Beaker' and the 'Dawnguard no Vampire Attacks' mod for showing how an item can be equipped without using a body slot. version 1.1 Added crafting recipes for anvil and tanning rack to transform an existing ring into its corresponding talisman. version 1.0 First release. Required cheating to acquire the talismans.